The Delena is perfect for bookworms. Let your little one fall asleep reading their favorite books with the built-in night light headboard with easy touch sensor accessibility. A sleek white finish over the bed and case goods for a clean and bright look. Set includes (1) bed and (1) night stand. Product frame is constructed from solid wood and wood veneers. Wipe clean with a damp cloth. Assembly required. Product made in Viet Nam. 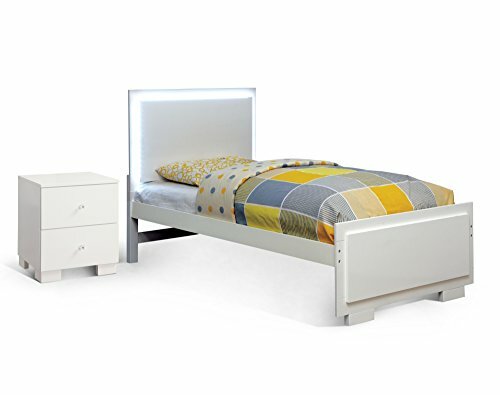 Once assembled, Bed measures 79.5 inches wide by 41.25 inches deep by 44 inches high; Nightstand measures 19 inches wide by 16 inches deep by 21 inches high; 30-days hassle-free replacement parts warranty. Pictures are for illustration purposes. All décor items are not included in this offer.